One of the most extraordinary things about the Great War which started 100 years ago is that no-one saw it coming. The political agenda in the summer of 1914 was conflated with the suffragettes, strikes and the Irish problem. There was so much noise at home that the bullets at Sarajevo were hardly heard above the din. So it’s a surprise to be told that in May 1914 at the annual meeting of the MCC – where surely the people who were running the country gathered – Lord Hawke set out plans for fixtures with the public schools “in the event of war”. These are Christopher Sandford’s words at the start of a chapter headed “Midsummer”. He then expands on his lordship’s exact words. But no plans were being made “in the event of war” in May 1914. 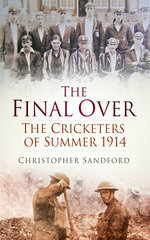 Sandford has taken the words from the MCC’s AGM a year later in 1915 when the war had been raging for nine months. It is perhaps the most egregious of the mistakes that litter this book, although there is no lack of choice. Sandford quotes from Wisden throughout the book. But sometimes this just compounds Wisden’s errors. He begins by noting that the first entry alphabetically in the obituaries of the 1915 Wisden is Capt D. G. H. Auckinleck. However, thanks to Andrew Renshaw’s magnum opus Wisden on the Great War (WOTGW), we know that Wisden misspelt his name and it should be Auchinleck. One of the first men to die chronologically was Arthur Hughes-Onslow, within a fortnight of the outbreak of war, although he is not mentioned until page 179. We are told he “suffered a heart attack and died while riding his horse up the gangway to the troop ship waiting to take them to France”. This is extra detail to his Wisden obituary which says he was taken “fatally ill” on the ship. But WOTGW explains that “fatally ill” was a euphemism which obscured the fact that he shot himself. Sandford is a fine writer and the subject matter is fascinating, but this book is discursive, disjointed and sometimes repetitive. For example, the death of Geoffrey Davies, who scored a hundred for Essex in the county’s final match before the season was suspended, is covered on page 90 and again on page 176. His description is firstly “tall and lean” and later “tall and slim”. Another misleading statement is the assertion: “Not surprisingly, all the counties lost money during the war.” Ironically, the fact was that the lack of cricket during the war, bringing cost savings not least in wages, allied to the continuing support of members, rescued some counties that in 1914 were teetering on bankruptcy. Worcestershire held a meeting in the very week that war was declared to consider a committee recommendation that the club be wound up. Fortunately an amendment was carried to soldier on, after members heard that four counties had agreed to contribute GBP20 for two years, and others had responded positively. Members also dipped into their own pockets to guarantee further amounts. Two years later, the annual meeting was told: “The accounts showed a balance of GBP419, this being the most satisfactory report in the history of the club.” Somerset reported: “So generous was the support given by members in 1916 that the committee reduced the club’s debt to GBP112, which sum they hope to clear off.” Middlesex said in 1916: “The accounts for the year were entirely satisfactory, a surplus of GBP243 being added to the same sum brought forward from 1915.” Other counties found themselves in a similar happy financial position. Sandford mentions Harold “Foster” in passing without giving Forster credit for being the most decorated first-class cricketer with two DSOs and two MCs; the index compounds the error by muddling him with H. K. Foster. It may be that Sandford does better with those who survived the war: they are less easy to check. But while he correctly says that reports of the death of the former Rugby schoolboy John Poole were premature, he states “he ended his life as an ostrich farmer in Rhodesia”. In fact, Jack Poole left Rhodesia in 1929 – we’re unsure about the ostriches – joined the diplomatic service in Sudan, and in due course, after being captured while fighting a rearguard action at Calais in May 1940, endured five years in PoW camps where he became a valued member of escape committees. His very full and extraordinary life, which merits half a dozen pages in Renshaw’s book, finally ended in 1966, some fifty years after his Wisden obituary. Sandford says that Robert Shaw, whose two brothers were killed, “survived the war, played cricket for Hampshire and the Combined Services, and died in his bed in England at the age of 95″. He did not play for Hampshire. He tells a nice tale of a match at Lord’s in July 1918 between an Australian XI and the Church and refers to the “fast bowling of a young Barnet divinity student named Wilfrid Lord”. He adds, quite unnecessarily and wrongly: “He was never heard of as a cricketer again.” You only have to open Who’s Who of Cricketers or click on Cricket Archive to discover he played a couple of First Class matches for Middlesex in 1919 and also that summer in a little known, but First Class, game for Demobilised Officers (so he had been in the forces) against Army and Navy. He played a lot of his cricket at Lord’s – was he a relation? – and we find him again on Cricket Archive playing a second eleven game in 1924 for Sussex at Hove, where he died in 1960. It only takes a modicum of research to hear of him as a cricketer again. Another survivor, Lionel Tennyson, provides a common thread as Sandford quotes throughout from his war diaries, and these are of interest, albeit Tennyson tells the story of his war at some length in From Verse to Worse and some of that material is replicated in Alan Edwards’s excellent biography, Regency Buck. Fans of Colin Blythe, another man who makes many appearances in the book, may be less happy with the portrait Sandford paints of him. The popular conception of cricket’s most high-profile casualty is that he was much loved by players and spectators alike. Sandford lumps him with the slow left-arm awkward squad which includes, in his book, the likes of Phil Edmonds, Phil Tufnell and Monty Panesar. It’s surely pertinent to explain he suffered from epilepsy, which meant that sometimes he was not fit enough to play for his country, although he was considered fit enough to die for it. One wonders if they will turn to Wisden on the Great War and copy the well-researched list that is supplied there by Steve Western. That book, as we have said before, should inspire others to go and dig even deeper into the stories of the men whose memory it perpetuates. It’s a pity that Sandford did not have it to hand when he was writing The Final Over, because he really needed to do some more research. He might have had trouble working out how to categorise it, but Martin clearly enjoyed Jonathan Smith's latest book.